Ed. by Atelier Augarten. Zentrum für zeitgenössische Kunst der Österreichischen Galerie Belvedere. Texts by Henri Bergson, Heike Maier, Gerhard Neumann, Peter Krapp, Beat Wyss und Thomas Trummer. Seven contemporary artists were invited to offer contributions on the phenomenon of mysterious recurrences from the past. The illustration part of the publication documents the works by Anna Gaskell, Isabell Heimerdinger, Constantin Luser, Jan Mancuska, Martina Steckholzer, David Thorpe, and Clemens von Wedemeyer. The theoretical contributions in the volume contain numerous references to Henri Bergson's historically unique text "Le souvenir du présent et la fausse reconaissance", which is reproduced in the original French, along with a German translation. 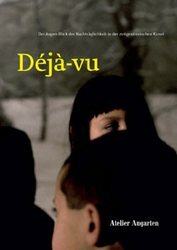 The cover themes range from the significance of déjà-vu for art and literature to the parallels created when a comparative analysis of déjà-vu is made with images produced in the media.